West Ham's Alan Pardew says he is "aghast" for fans after the Hammers were dumped out of the Carling Cup by League One side Chesterfield. The 2-1 defeat at Saltergate was their eighth straight loss and extended the club's worst run in 74 years. "This is the worst patch of my career as a player or a manager and it's not getting any easier," he said. "It's not acceptable for me, the players, the club and above all the fans. I'm aghast for them." After the game, chairman Terry Brown reportedly went into the dressing room and told the team they had played "like a pub team" and that the £16,000 spent on an overnight stay before the game had been a waste of money. Things had looked like they might finally be improving when Marlon Harewood ended West Ham's 671-minute goal drought by putting them ahead in the fourth minute. But goals by Colin Larkin and Caleb Folan gave Chesterfield a memorable win, as the Hammers suffered their fifth Carling Cup exit at the hands of a lower league side in 10 years. 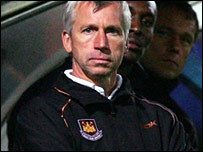 "We're out of this competition, out of the Uefa Cup and in a bad position in the league," said Pardew. "The responsibility for the team and the results is mine and unfortunately they don't look too well right now. "I'm big enough to take that on board and come out fighting." West Ham are second from bottom in the Premiership and life will not get any easier on Sunday when they host Blackburn. "You need characters and they must really come to the fore now," he said. "If we ever needed our fans to give us a lift it is now - and hopefully we are at the bottom of the barrel in terms of this run." But he had no complaints with the results at Saltergate. "We are on an awful run and the performance showed a lack of confidence, we didn't pass the ball well," said the Hammers boss. "We had a few moments at 1-1 to take the game and didn't, and in the end something's fallen for them in the box and they got their reward. "Their desire levels were really high and they had some good performances. "It's just where we are at the moment, we never really got going and fair play to them for that." Chesterfield manager Roy McFarland played down his team's victory. "We hope to do well in all the cups, but like every manager will tell you the league is the most important thing," said McFarland, whose team are 15th in League One. But he paid tribute to the efforts of his players, adding: "They kept their confidence, they kept their determination and we kept the tempo going in the second half. "They pushed us near the end but I felt over the 90 minutes we deserved to win the game."